Have you tried the Fastream IQ Web and FTP Server before? If yes, please consider recommending it by clicking the Facebook "Recommend" button! This download is 100% clean of viruses. It was tested with 26 different antivirus and anti-malware programs and was clean 100% of the time. View the full Fastream IQ Web and FTP Server virus and malware test. The file that was tested: IQWebFTPServer.exe. Tip: If you're experiencing trouble downloading this file, please disable any download managers to Fastream IQ Web and FTP Server you may be using. If you're receiving a 404 File Not Found error, this means the publisher has taken the file offline and has not updated their links with us for Fastream IQ Web And FTP Server. Please do drop us a note in the event of a missing file. Fastream Technologies provides their software as a Windows Executable file and therefore installation is as easy as downloading the file IQWebFTPServer.exe and running it directly after retrieving it. We highly suggest using antivirus software before running *any* files from the Internet. The company hosting this file has a trust rating of 9/10. Servers for Windows - Integrated Proxy server, web cache, firewall and email server. Servers for Windows - WinAgents TFTP Server for Windows is a full-featured TFTP server for Windows. 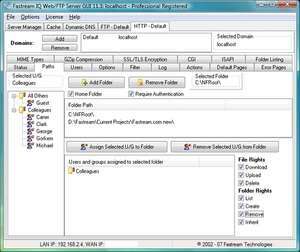 WinAgents TFTP Server runs as a background task and doesn't require permanent attendance. It has been originally designed to work in 24x7 background operation mode. Using WinAgents TFTP Server, you can make reserve copies of device settings, update flash images, store sound files for IVR systems and perform other essential operations.